In a small saucepan, combine cranberries, 3/4 cup sugar, 1 tablespoon cornstarch and apple cider. Bring to full boil over medium heat, stirring frequently; boil gently 5 minutes. Cool 15 to 20 minutes. 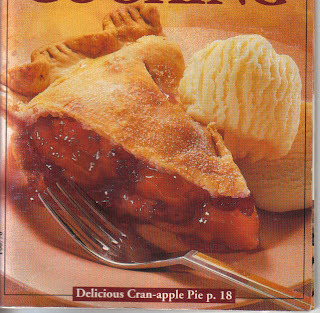 Prepare pie crust according to package directions for two-crust pie using 9-inch pie pan. Heat oven to 425 F. In large bowl, combine apples, 2/3 cup sugar and 2 tablespoons cornstarch; toss to coat apples. Stir in cooled cranberry mixture; toss lightly. Spoon into pie crust-lined pan. Top with second crust; seal and flute edges. Cut slits in top crust; brush with milk and sprinkle with 2 teaspoons sugar. Bake at 425 F. for 45 to 55 minutes or until golden brown and apples are tender. Cover edge of pie crust with strips of foil after 15 to 20 minutes of baking to prevent excessive browning. 8 servings. "Pillsbury Harvest Time Baking & Cooking", Classic Cookbooks #129, November 1991.